Heya folks! Figured I'd introduce myself to the WT Division. I'm Chandler, a guy obsessed with technology (Smartphones, SOC's, Display's, etc), cars and graphic design, if it exists... I can probably tell you stuff about it for a few hours straight =) I'm 19 and currently a Digital Marketing Coordinator for Mazda. I love road trips, photography and I spend at least six hours in Photoshop or similar programs on a daily basis. I'm pretty chill and just enjoy sitting back and having some fun. Been playing WT since 2013, through the years I've played hundreds of Squadron Battles and accumulated a few thousand hours of playtime (Not my proudest achievement) and still have much to learn and improve. Just got done playing with KillinYue and Kitty and had an awesome first match with my TAW Brethren! I look forward to playing with more of you and meeting some new friends! Welcome to the TAW Family. Drinks are in fridge, snacks are on the table, TAW Shop is available for all swag needs, TAW Radio is there for some easy listening while gaming, and don't touch Hazz's coffee. Hello and welcome. From the EFT/SCZ community, feel free to drop in anytime and have a chat. 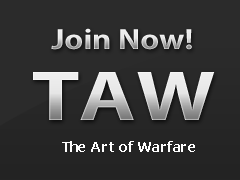 Welcome to TAW! Your profile looks, love the Sundy Dailys! Look forward to seeing you in the WAR division. Welcome to TAW! Nice portfolio btw!